The SEA's Model come from the Tools for Coping Series by Jim Messina available on www.coping.us. The Self-Esteem Seekers Anonymous model of recovery is very applicable to people with alcohol and/or substance use disorders. 1. We admitted that we were powerless over the behavioral consequences of our low self‑esteem; that our lives had become unmanageable. 2. We came to believe that our self‑esteem could heal and grow by our cooperating with a power greater than ourselves who is our Higher Power. 3. We made a decision to develop a spiritual life in which our wills and lives would be open to the healing graces of our Higher Power. 4. We made a searching and fearless inventory of our strengths and achievements as well as of our weaknesses and failures. 5. We admitted to our Higher Power, to ourselves, and to others the exact nature of our strengths and weaknesses and of our achievements and failures. 6. We were entirely ready to assist our Higher Power to affirm our positive and remove our negative behavioral traits. 7. We humbly asked our Higher Power to give us the strength to let go of our shortcomings. 9. We made direct amends to such persons whenever possible, except when to do so would injure them or ourselves. 10. We continued to take a personal inventory and affirmed our goodness while promptly admitting our wrongs. 11. We sought through prayer and meditation to improve our conscious contact with our Higher Power, praying for knowledge of what we are capable of becoming and the power to carry this out. 12. Having had a spiritual awakening or renewal as a result of these steps, we tried to carry this message to others hurting from low self‑esteem and to practice these principles in our life. First, you need to analyze your thoughts about your life and identify all irrational and unrealistic beliefs, thinking, or ideas which are at the root of your alcohol and/or substance use disorder and other problems in your life. Once you have identified the "sick'' thoughts, then you need to replace them with healthier, more rational, and realistic thinking, beliefs and ideas. It is at this point that you begin to develop daily self-affirmations which encourage you on the road to recovery from alcohol and/or substance use disorder. Second, after your thoughts have become healthier, more rational, and realistic, you then need to identify all of your "sick'' emotions and feelings which were based on your old "sick'' thoughts and then integrate your "new'' healthier thoughts with your emotions and feelings. That way you have healthier, more rational and realistic emotional and feeling responses to your life and you begin to feel better about yourself and your ability to handle your alcohol and/or substance use disorder. It is at this point that you work at incorporating the self-affirmations you have been telling yourself and experience feelings of self-confidence, self-worth, and self-deservedness. Third, only after you have altered your “sick” thoughts and “sick” emotions can you change your “sick”actions and behaviors. 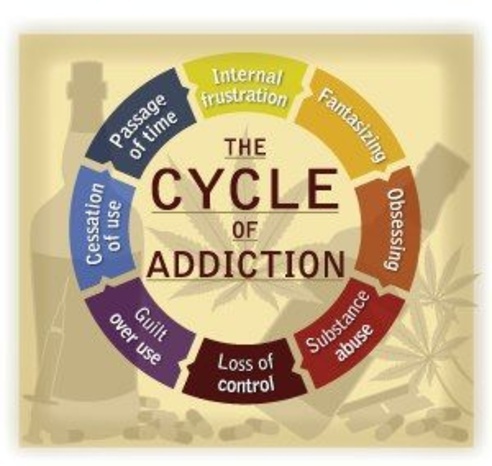 Once you have developed a healthier, more rational, and realistic thinking and emotional life, you can take actions and exhibit behaviors which are healthier, more rational and realistic and result in increased recovery from your alcohol and/or substance use disorder and result in a healthier lifestyle of coping. WARNING: You cannot change your actions or behaviors before you have changed your emotional and feeling responses to your alcohol and/or substance use disorder. When people change their actions because it is the “correct” thing to do without feelings which go along with them, then their recovery falls flat and dies. You need to change your thoughts and emotions before your actions become “authentic” and have greater “staying” power. Alcohol and/or drug use has not hurt me so far so why worry about it – BUT I have no idea what alcohol and drug use is currently doing to my body and brain. NEW MESSAGE: It is my right to take care of my body and my health and prevent from getting sick. NEW MESSAGE: To prevent from having any problems in the future I will avoid abusing and over using alcohol and drugs. NEW MESSAGE: I will prevent hurting others in my pursuit of alcohol and drugs by eliminating over use and abuse of them. NEW MESSAGE: I will find new ways to relax and enjoy life which do not require the use of alcohol or drugs. NEW MESSAGE: I chose not to be in denial about the negative affects of alcohol and drugs and commit to no longer over using and abusing them. It is my right to take care of my body and my health and prevent from getting sick. I will avoid abusing and over using alcohol and drugs to prevent from having any problems in the future. I will prevent hurting others in my pursuit of alcohol and drugs by eliminating over use and abuse of them. I will find new ways to relax and enjoy life which do not require the use of alcohol or drugs. I chose not to be in denial about the negative affects of alcohol and drugs and commit to no longer over using and abusing them. I will avoid people, places, and situations, which lead me to consider the use or abuse of alcohol and drugs. I will focus on maintaining a healthy body. I will find alternative ways of relaxing and entertaining myself. I will find alternative outlets when I am feeling bored or restless. I will seek the support of others when I am feeling the desire to use or abuse alcohol and drugs. Face your anger head on! Resume: In your journal make a commitment to use ANGER System to rid self of anger so you do not resort to alcohol and/or other substances to calm yourself. Gain a healthy, rational & realistic outlook on what is happening to when you are depressed, lost, hopeless and ready to give up which could lead you to use or abuse alcohol and/or other substances. Identify what actions you fall into which end up leading to relapse events with alcohol and/or other substances use? Identify people who will be great support people who will help you from relapsing in your use of alcohol and/or other substances.